2015 Ford Mustang GT, 5.0L, V8, Fastback/Hardtop Only, Axle-back, 3.00 Mandrel Bent Tubing, Dual System, Super 44 Series Mufflers, 4.00 Polished Tips, American Thunder, DOR, 409S Stainless Steel, 817710. 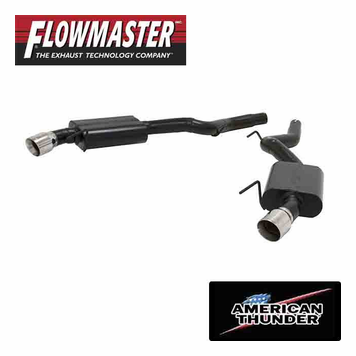 American Thunder exhaust systems from Flowmaster are designed with the latest exhaust technology available--resulting in improved acceleration, passing power, and fuel mileage. A key to these performance upgrades is Flowmaster's use of mandrel-bent tubing, which allows superior exhaust gas flow. These Flowmaster American Thunder exhaust systems also feature mufflers (single or dual) that deliver plenty of the rich Flowmaster sound you expect.